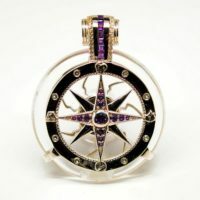 This collaborative effort between Quantum Stones and Galactic Historian Andrew Bartzis is designed in representation of a galactic compass to help guide users to divine realms and sources of higher information. Wrapped in .925 sterling silver, drenched with strategically placed garnets and white topaz and quantum infused with three powerful LightShield™ harmonic codes from nature, this custom amulet is a powerful transformational tool. 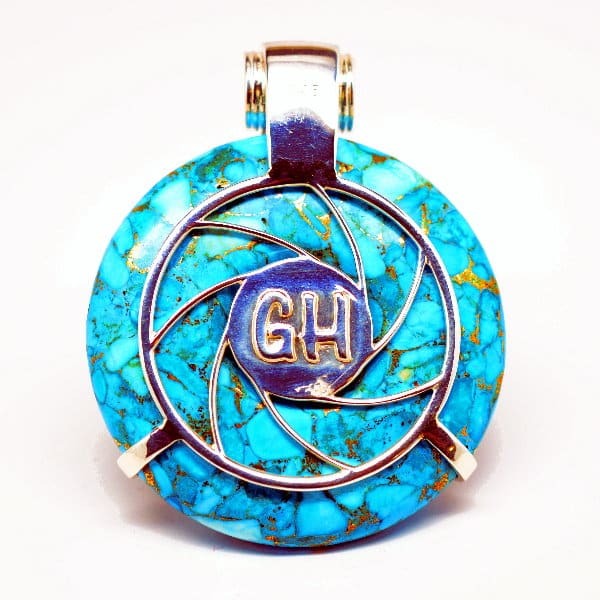 Turquoise has been prized since ancient times as a stone of spiritual attainment believed to filter the fifth element—ether—into the etheric body. Its powerful effect on the throat and third eye chakras aid truthful communication from spirit and help one access past life experiences and Akashic knowledge. Upon the compass we’ve placed the symbols of the natural world: Air in the North, Fire to the East, Water to the South, and Earth to the West. This aims to help transcend into a state to receive the divine information and assistance available to us through the natural and cosmic worlds. 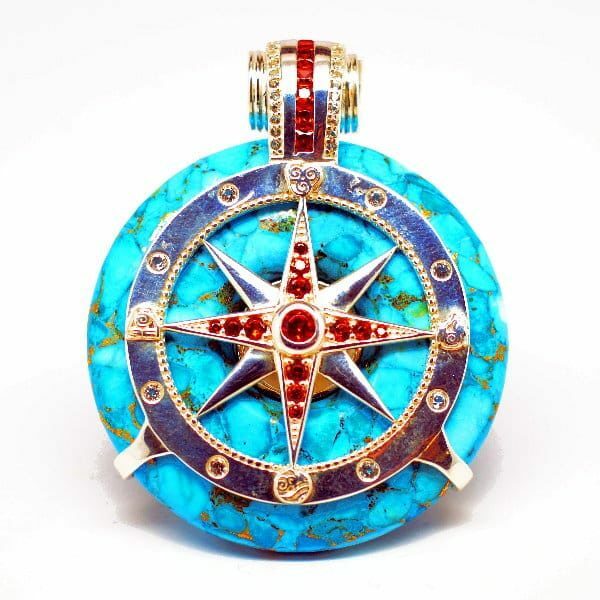 Adorned with a combination of 57 striking garnets and white topaz gemstones, this amulet also helps extract negative energies and transforms them into vitality and clarity that promotes a greater sense of awareness, peace and purpose. While garnet aids health by stimulating all chakras, white topaz is a strong stone of truth and manifestation that aids wearers in achieving desires more quickly. 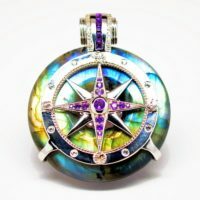 Each limited edition Galactic Compass Amulet collectively designed by Andrew Bartzis and Quantum Stones is backed with a complete guarantee of satisfaction. 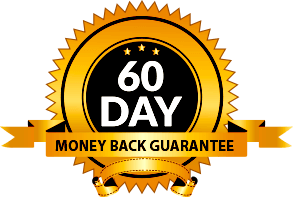 All stones, crystals and gemstones are 100% authentic and are of the highest quality. Pendants are quantum infused with our exclusive LightShield™ harmonic infusions of the Sound of Sun, Sound of Earth, Shield My Aura and can be customized with up to three additional frequencies for an additional charge. 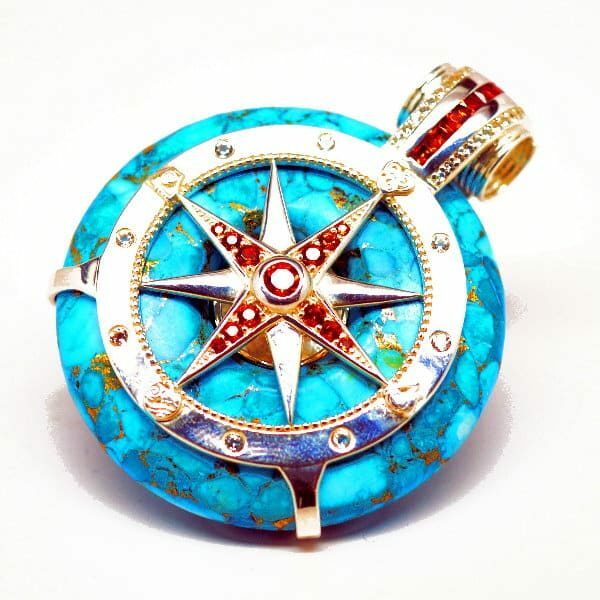 Your healing tool will arrive in a plush jewelry case and gift box along with a leather or stainless steel chain of your choice and a polishing cloth. 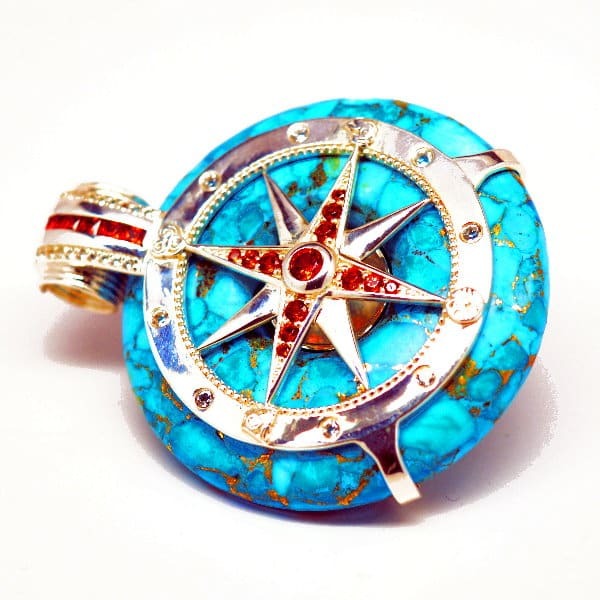 Be the first to review “Turquoise w/Garnet & White Topaz – Galactic Compass” Click here to cancel reply.